I haven’t seen nearly enough Harold Lloyd, so when a High Def print of a promising late-silent era film shows up on TCM, I try to grab it. SPEEDY was actually Lloyd’s final silent film. I watched SPEEDY (1928) on 2.21.15. It was my first viewing of the film. One of the wonderful things about watching early film is getting exposed to contemporaneous images of stuff you just don’t get to see that often. In SPEEDY, we get to see nicely filmed clips of a game in progress at Yankee Stadium, we get to see the 1920’s skyline of NYC looking as if it is actively stretching toward the sky as it is being observed, and we get to see the amusement park rides – some which would be deemed not safe for 2010s Americans – with our main characters bouncing from attraction to attraction. 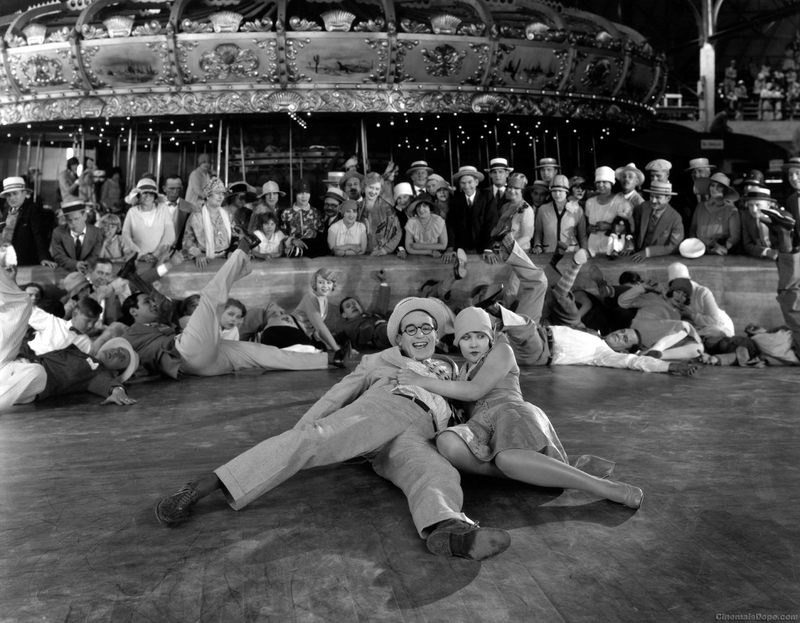 In SPEEDY, the title character (Harold Lloyd) is a baseball fanatic who can’t keep a job because he is too busy monitoring the scores. He has a lovely girlfriend, Jane (Ann Christy), who puts up with him thanks to his endearing personality. Her grandfather (Bert Woodruff), is the last of a breed; operating a horse drawn carriage around the streets of New York. Some rail company wants to buy him out, but the movie starts with his resistance. 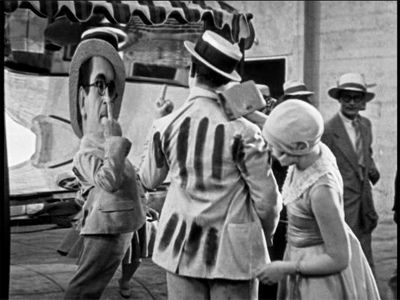 If it would seem that this old-versus-new theme is fitting, well that would be because Harold Lloyd never made another silent film after this one. That general plot gets us going, but we take a welcome detour to Coney Island for the aforementioned amusements and then to a segment of the film when Speedy gets a job as a cab driver. As with much of the silent comedy of the time, the lead character bounces from scenario to scenario with the absurdity of each successive fiasco increasing in silliness. Speedy, for whatever reason, is a bit deceptive and not a particularly nice guy. Lloyd doesn’t play him as the down-on-his luck Tramp or as the indifferent Stoneface, instead Lloyd’s Speedy fancies himself the smartest and most clever guy in any given room. This doesn’t make him unlikable, but that is probably only because of Lloyd’s inherent charm. Oh, and hey, he gives himself the finger in a fun house mirror at one point. These films, as one might expect, try to save the craziest bit for last. Speedy hears about a plot to start a fight on the horse-drawn carriage in order to take it out of commission. He recruits a bunch of guys, led by Civil War vets (who would have been very much alive when this movie was made… crazy to think about) and an all-out no-holds-barred brawl erupts in the streets of New York City. You would think this would be the culmination of it all, but there is more to come. Lloyd has all of his extensive talents on display here. He is funny, he is likable, and his physical humor is sharp. He also, along with Director Ted Wilde, allows the supporting cast to shine. It is too bad that the movie loses track of Jane halfway through the film, because Ann Christy is a scene stealer. Another fun bit happens when Babe Ruth shows up, playing himself. All in all, this is a fun movie. Worth seeing for Lloyd’s brilliance, but not on the same level as something like SAFETY LAST. ~ by johnlink00 on February 21, 2015.